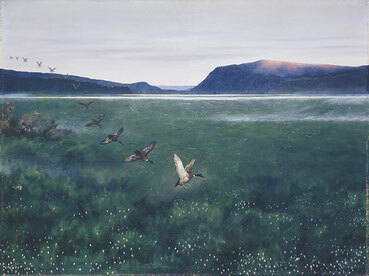 The Twelve Wild Ducks, Norway - andrea-hofmann308s Webseite! Once on a time there was a queen who was out driving, when there had been a new fall of snow in the winter; but when she had gone a little way, she began to bleed at the nose, and had to get out of her sledge. And so, as she stood there, leaning against the fence, and saw the red blood on the white snow, she fell a thinking how she had twelve sons and no daughter, and she said to herself, "If I only had a daughter as white as snow and as red as blood, I shouldn't care what became of all my sons." But the words were scarce out of her mouth before an old witch of the trolls came up to her. "A daughter you shall have," she said, "and she shall be as white as snow and as red as blood; and your sons shall be mine, but you may keep them till the babe is christened." So when the time came the queen had a daughter, and she was as white as snow, and as red as blood, just as the troll had promised, and so they called her "Snow-White and Rosy-Red." Well, there was great joy at the king's court, and the queen was as glad as glad could be; but when what she had promised to the old witch came into her mind, she sent for a silversmith, and bade him make twelve silver spoons, one for each prince, and after that she bade him make one more, and that she gave to Snow-White and Rosy-Red. But as soon as ever the princess was christened, the princes were turned into twelve wild ducks, and flew away. They never saw them again. Away they went, and away they stayed. So the princess grew up, and she was both tall and fair, but she was often so strange and sorrowful, and no one could understand what it was that ailed her. But one evening, the queen was also sorrowful, for she had many strange thoughts when she thought of her sons. She said to Snow-White and Rosy-Red, "Why are you so sorrowful, my daughter? Is there anything you want? If so, only say the word, and you shall have it." "Oh, it seems so dull and lonely here," said Snow-White and Rosy-Red." Everyone else has brothers and sisters, but I am all alone; I have none; and that's why I'm so sorrowful." "But you had brothers, my daughter," said the queen. "I had twelve sons who were your brothers, but I gave them all away to get you." And so she told her the whole story. So when the princes heard that, she had no rest; for, in spite of all the queen could say or do, and all she wept and prayed, the lassie would set off to seek her brothers, for she thought it was all her fault; and at last she got leave to go away from the palace. On and on she walked into the wide world, so far, yon would never have thought a young lady could have strength to walk so far. So, once, when she was walking through a great, great wood, one day she felt tired, and sat down on a mossy tuft and fell asleep. Then she dreamt that she went deeper and deeper into the wood, till she came to a little wooden hut, and there she found her brothers; just then she woke, and straight before her she saw a worn path in the green moss, and this path went deeper into the wood; so she followed it, and after a long time she came to just such a little wooden house as that she had seen in her dream. Now, when she went into the room there was no one at home, but there stood twelve beds, and twelve chairs, and twelve spoons -- a dozen of everything, in short. So when she saw that she was so glad, she hadn't been so glad for many a long year, for she could guess at once that her brothers lived here, and that they owned the beds, and chairs, and spoons. So she began to make up the fire, and sweep the room, and make the beds, and cook the dinner, and to make the house as tidy as she could; and when she had done all the cooking and work, she ate her own dinner, put down her spoon and crept under her youngest brother's bed. So she had scarcely laid herself down before she heard something flapping and whirring in the air, and so all the twelve wild ducks came sweeping in; but as soon as they crossed over the threshold they became princes. And so each took up his silver spoon and was going to eat. But when each had taken his own there was one still left lying on the table, and it was so like the rest that they couldn't tell it from them. "No" said the youngest; "'twere a shame to kill her for that. She has nothing to do with our suffering ill; for if any one's to blame, it's our own mother." "Oh! gracious goodness! don't kill me, for I've gone about seeking you these three years, and if I could only set you free, I'd willingly lose my life." "Well! "said they, "if you will set us free, you may keep your life; for you can if you choose." "You must pick thistledown," said the princes, "and you must card it, and spin it, and weave it; and after you have done that, you must cut out and make twelve coats, and twelve shirts, and twelve neckerchiefs, one for each of us, and while you do that, you must neither talk, nor laugh, nor weep. If you can do that, we are free." "But where shall I ever get thistle-down enough for so many neckerchiefs, and shirts, and coats? " asked Snow-White and Rosy-Red. "We'll soon show you," said the princes. And so they took her with them to a great wide moor, where there stood such a crop of thistles, all nodding and nodding in the breeze, and the down all floating and glistening like gossamers through the air in the sunbeams. The princess had never seen such a quantity of thistledown in her life, and she began to pluck and gather it as fast and as well as she could; and when she got home at night she set to work carding and spinning yarn from the down. So she went on a long long time, picking, and carding, and spinning, and all the while keeping the princes' house, cooking, and making their beds. At evening home they came, flapping and whirring like wild ducks, and all night they were princes, but in the morning off they flew again, and were wild ducks the whole day. But now it happened once, when she was out on the moor to pick thistledown -- and if I don't mistake, it was the very last time she was to go thither -- it happened that the young king who ruled that land was out hunting, and came riding across the moor and saw her. So he stopped there and wondered who the lovely lady could be that walked along the moor picking thistledown, and he asked her her name, and when he could get no answer, he was still more astonished. And at last he liked her so much, that nothing would do but he must take her home to his castle and marry her. So he ordered his servants to take her and put her up on his horse. Snow-White and Rosy-Red, she wrung her hands, and made signs to them, and pointed to the bags in which her work was, and when the king saw she wished to have them with her, he told his men to take up the bags behind them. When they had done that the princess came to herself, little by little, for the king was both a wise man and a handsome man too, and he was as soft and kind to her as a doctor. But when they got home to the palace, and the old queen, who was his stepmother, set eyes on Snow-White and Rosy-Red, she got so cross and jealous of her because she was so lovely, that she said to the king, "Can't you see now, that this thing whom you have picked up, and whom you are going to many, is a witch. Why, she can't either talk, or laugh, or weep!" So when the year was almost out, Snow-White and Rosy-Red brought a prince into the world, and then the old queen was more spiteful and jealous than ever, and at dead of night, she stole in to Snow-White and Rosy-Red, while she slept, and took away her babe, and threw it into a pit full of snakes. After that she cut Snow-White and Rosy-Red in her finger, and smeared the blood over her mouth, and went straight to the king. "Now come and see," she said, "what sort of a thing you have taken for your queen; here she has eaten up her own babe." Then the king was so downcast, he almost burst into tears, and said, "Yes, it must be true, sure I see it with my own eyes; but she'll not do it again, I'm sure, and so this time I'll spare her life." So before the next year was out she had another son, and the same thing happened. The king's stepmother got more and more jealous and spiteful. She stole in to the young queen at night while she slept, took away the babe, and threw it into a pit full of snakes, cut the young queen's finger, and smeared the blood over her mouth, and then went and told the king she had eaten up her own child. Then the king was so sorrowful, you can't think how sorry he was, and he said, "Yes, it must be true, since I see it with my own eyes; but she'll not do it again, I'm sure, and so this time too I'll spare her life." Well! before the next year was out, Snow-White and Rosy-Red brought a daughter into the world, and her, too, the old queen took and threw into the pit full of snakes, while the young queen slept. Then she cut her finger, smeared the blood over her mouth, and went again to the king and said, " Now you may come and see if it isn't as I say; she's a wicked, wicked witch for here she has gone and eaten up her third babe too." Then the king was so sad, there was no end to it, for now he couldn't spare her any longer, but had to order her to be burnt alive on a pile of wood. But just when the pile was all ablaze, and they were going to put her on it, she made signs to them to take twelve boards and lay them round the pile, and on these she laid the neckerchiefs, and the shirts, and the coats for her brothers, but the youngest brother's shirt wanted its left arm, for she hadn't had time to finish it. And as soon as ever she had done that, they heard such a flapping and whirring in the air, and down came twelve wild ducks flying over the forest, and each of them snapped up his clothes in his bill and flew off with them. "See now! " said the old queen to the king, "Wasn't I right when I told you she was a witch; but make haste and burn her before the pile burns low." "Oh!" said the king, "We've wood enough and to spare, and so I'll wait a bit, for I have a mind to see what the end of all this will be." As he spoke up came the twelve princes riding along, as handsome well-grown lads as you'd wish to see; but the youngest prince had a wild duck's wing instead of his left arm. "She hasn't eaten them at all," said the princes. "Speak now, sister. You have set us free and saved us, now save yourself." Then Snow-White and Rosy-Red spoke, and told the whole story; how every time she was brought to bed, the old queen, the king's stepmother, had stolen into her at night, and taken her babes away, and cut her little finger, and smeared the blood over her mouth. And then the princes took the king, and showed him the snake pit where three babes lay playing with adders and toads, and lovelier children you never saw. "You have spoken your own doom," said the king, "and you shall suffer it at once."